. 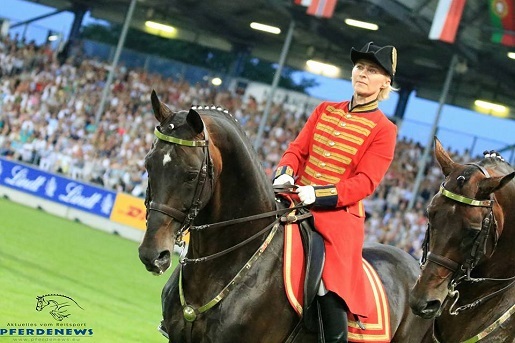 :: Opened Equestrian Championships Aachen 2015 with a great show: Big Feelings ::. NRW state premier Hannelore Kraft, it was reserved to give the world famous Main Stadium to officially launch the biggest sporting event in Germany in 2015. The show for the exception Championships surprised by colorful diversity that always allowed a look back to the almost 120-year history of equestrian sport in Aachen. Rapid deposits alternated with surprise guests and perfect effects. About 1,000 extras and more than 300 horses enthusiastic spectators in the sold-out stadium. Whether cold blood race, riders in the Saddle, vintage cars, Vespa scooters or carriages - memories of long forgotten times were awakened. 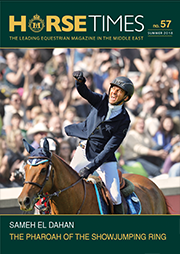 Also equestrian legends showed up on the "hallowed turf" and provided for spine-tingling moments - as Hans Günter Winkler met Isabell Werth, Paul Schockemöhle to Meredith Michaels-Beerbaum and Michael Freund to Ludger Beerbaum, Rodrigo Pessoa and Nelson. Finally it gave a standing ovation for all. With absolute perfection impressed the Great Landgestüt Quadrille. She had with Federal Defence Minister Ursula von der Leyen, a prominent rider in their ranks. Their Euro a hymn was composed, which accompanied the impressive collection of 30 standard-bearers and 30 nations riders in imaginative costumes. After the presentation of the five-EM disciplines in Aachen there was a furious conclusion: The representation of the four elements of fire, water, air and (Pf) earth - with aerialist, water fountains, drums, pyrotechnics and stunt riders. "Be part of it" - that's the motto of the Riding Championships in Aachen. The mood in the main stadium on Tuesday evening it was no longer any doubt. With the celebration of the FEI European Championships Aachen 2015 have begun.The competitions take up to 23 August. In the five disciplines jumping, dressage, driving, vaulting and reining 13 gold medals will be awarded. More than 400 athletes from 30 nations are expected at the traditional show grounds in the Aachen Soers.Alone ARD, ZDF and WDR transferred 30 hours from Aachen, a large part will be broadcast live.